An Englishman in Colombia: I'm on My Knees! Diego arrived this morning with Oscar at 9am, having phoned to say they had been delayed on the Autopista. By this time I had already walked the dogs, had breakfast and been working for two hours. Unfortunately there was no selfie taken, but I was doing this when they arrived, until they shouted at me for doing so, knowing the problem with my back. 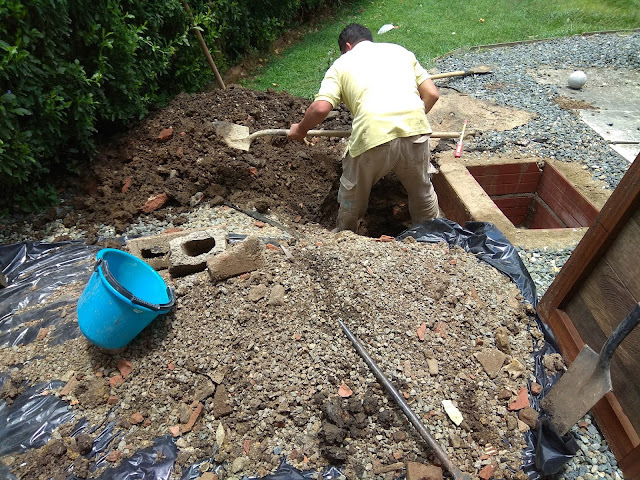 However I continued digging, whilst Diego and Oscar went down to build the new access box in the neighbours garden, where the fun and games had taken place yesterday. 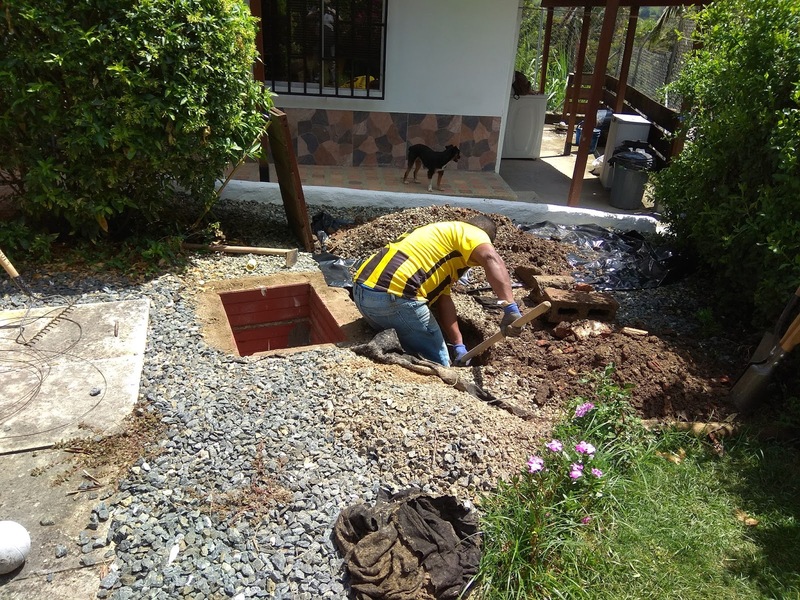 Once down to the pipe the damage was found and cut out, and rebuilt, it wasn't just to the trap, but also the overflow to the septic tank, which made the process more difficult. I think today was the hottest day of the year and all three of us were suffering. Marcela and I were loaning hats, as they hadn't brought one with them. Marcela prepared lunch for everyone, which went down well, as Oscar had only brought a tub of cooked rice, and Diego a tub of frijoles (beans). I then donned my boots and jumped into the trap to remove the old filter and, all the river stones, but it just kept going down, so after Marcela had gone to work, and the two workmen woken up from their siesta, it was decided to leave the river stones in place, and put the exit pipe, at the same level as the stones, therefore the bulk of the water would immediately leave via the pipe, and not the soakaway. Oscar then went back into the neighbours garden, to collect the tools and check on his work, so I went with him, to measure up for a wooden top, as we entered the garden, he told me to watch myself as he had been bitten by one of the pack of dogs, I wish he had said so earlier, I would have asked the neighbour to contain them, as they had a reputation for biting, but there was no problem... the box is basic, but functional there is a temporary pipe across it at the moment to stop the concrete washing away, I will remove that tomorrow when I take the top. Work was finally finished at 4pm, Diego and Oscar, were paid and left, then it was time for me to set to again, I cleaned up all the tools, washed up the lunch things, of which there was a mountain, because Marcela couldn't use the water until the work was done...lucky her! I have done an eleven hour shift today, and don't I know it, and may not be getting up tomorrow. I am hoping that once the residual water has soaked away, that the problem is now rectified, but I won't know until tomorrow. 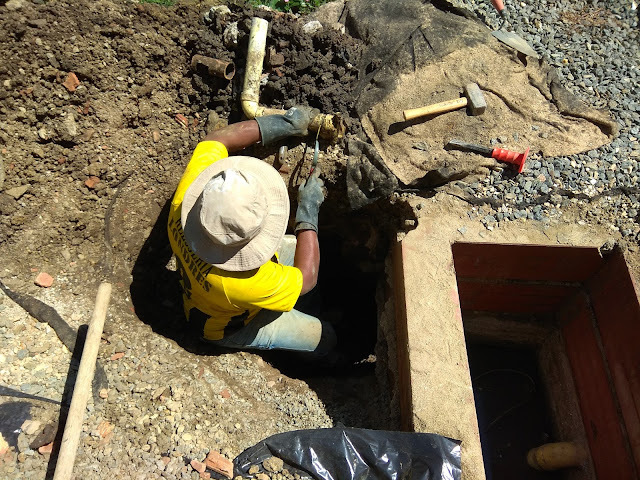 So I'm on my knees physically, and also praying that the job is now complete, I don't want to hear any more about Septic tanks or traps for the rest of my days, although I am sure that is wishful thinking.